현재 가능한 작업은 아래와 같습니다. 발표코드 LIFE.O-1 이곳을 클릭하시면 발표코드에 대한 설명을 보실 수 있습니다. Transthyretin (TTR), in its native tetrameric state, is an essential transporter of thyroxine and holo-retinol binding protein for human. However, its dissociation into the mis-folded monomer facilitates abnormal aggregation of TTR, causing deposition of TTR aggregates typically in the peripheral nervous system or in the heart. Although understandings to this TTR-aggregation mechanism have succeeded to develop effective therapeutics stabilizing the tetrameric state of TTR, it is still elusive which structural transition is indeed responsible for its aggregation. Here, we determined with nuclear magnetic resonance (NMR) spectroscopy the three-dimensional structures of the two TTR variants: amyloidogenic monomeric TTR and its protective (less amyloidogenic) variant, T119M. Distinctive to the native tetrameric state, the misfolded monomer of TTR presented structural features in which the C-terminal beta-strand is released and the neighboring loops are perturbed (refer the attached figure). 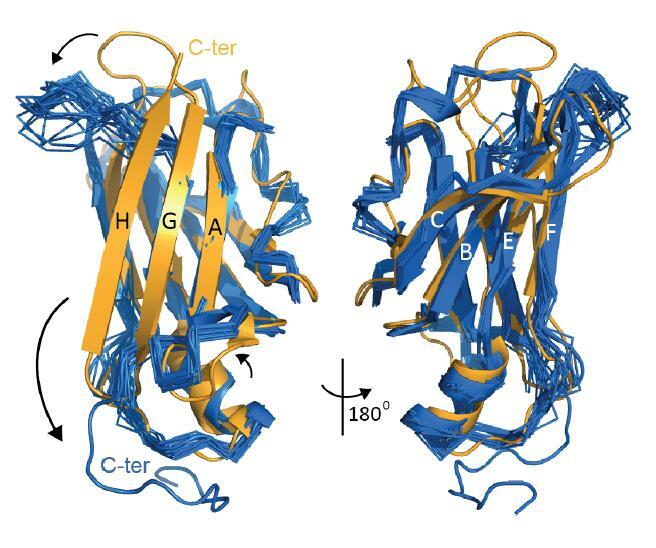 On the other hand, introduction of T119M mutation caused non-native rearrangement of the beta-strand structure; it appears that this structural transition damped conformational fluctuations of the C-terminal beta-strand, which is known to be important for TTR aggregation. - 등록된 그림이 있는경우 그림을 클릭하시면 원본 그림파일을 볼 수 있습니다. - 최종본을 확인하지 않아 발생된 문제에 대해서는 책임지지 않습니다. - 미리보기의 그림위치는 임시 위치입니다. 모든 그림파일은 Abstract 하단에 위치하게 됩니다.